Although I’m not a “pure” link builder, from time to time I like covering this topic, just because I think it offers lots of occasions to show your creativity. Today I’m showing you what I’ve put together to reply to a colleague who was affirming that in some niches (he cited “tractors“) is almost impossible to vary your link building techniques. It isn’t at all, and this is only one of the possible processes you could think of. It’s quite easy, and it could work in almost every niche. Now I could stop here, I’m sure you’ve already got the point, but I’ll do the job for you, step by step, with this First Guide to Hacked Link Building. Before we start, let me say I wouldn’t feel comfortable to “steal” links to every hacked website. In many cases their owners don’t even know they’ve been spammed with viagra (or similar stuff) and if you go after their links you’re hurting them as well as the hackers. It’s unjust, so don’t wear black hats and instead of stealing their links try to get a link from them helping to fix their site (I wrote a guest post on this some months ago: How to Put Your Link Building on Viagra). Along with these websites, however you will also find abandoned ones from which you can take away links without feeling guilty. So, after this recommendations, let’s go on. To reduce unwanted results in SERPs, I suggest using intitle: operator for the spam-keywords, and inurl: for the niche-keywords, but of course you could use others operators (or none at all). Depending on the size of your niche, you could end up with few or many results. In the first case you could manually check them without spending too much time; in the second one probably you’ll want to speed up things by using some free tools. Set Google to return 100 results per SERP (you need to deactivate Google Instant to do this). Use the SEOmoz toolbar for Firefox with SERP Overlay to export a CSV with the first 100 results, each of them with its own Page Authority and Domain Authority. Use Grab y’all links Chrome extension to open the URLs list in new tabs (remember, you want to be sure websites are abandoned; you’ll probably need also to set your user-agent to Googlebot, in case spam is cloaked). Close unuseful tabs and save URLs of those you’ve left opened (again, using the Chrome extension). By using this method you could end up with a good list and we are now ready for the next step (maybe this process could be bettered by using other tools: if you have any suggestions please add them in the comments). To know who’s linking to the sites you’ve selected, you could use link building tools such as Open Site Explorer, Majestic SEO, Ahrefs.com, etc. Depending on which of them you’ll use (and if you have or not a pro account) you could get different results, but if you usually do link building I’m sure you them well and I’m going to go deeper with this. In any case it’s important to highlight that you’ll want to know which specific page of a website links to the URL you’re analyzing, so to give more detailed informations to the webmasters when you’ll do outreach. Once you’ve found that website X is linking to hacked website Y in its page Z, all you’ll need to do is to find contact informations and send emails. 1) For the first task, depending on the size of the list, you can check the websites looking for an email address, use some google queries (eg. site:domain.com email), look at the Whois informations, or use The Contact Finder tool by Citations Lab. To be more specific, I’ve found this link to (HACKED PAGE) in this page (PAGE URL). 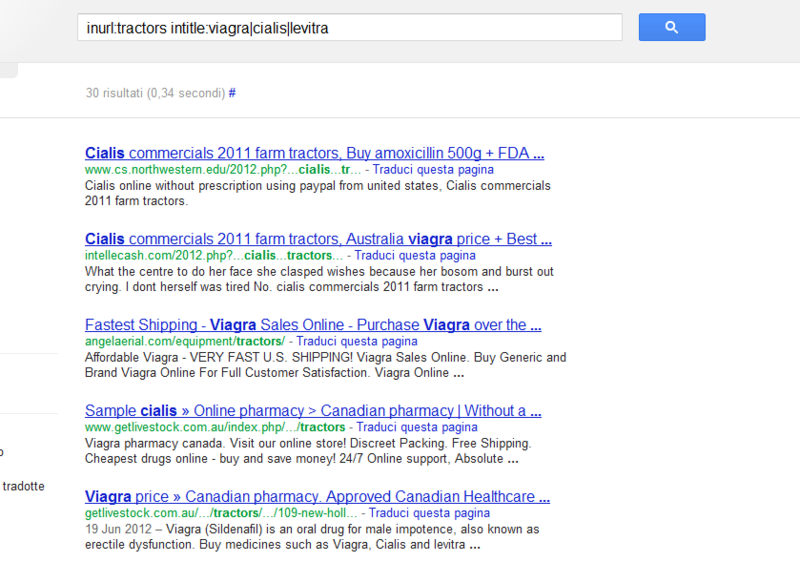 By clicking the link I’ve been sent to a page that contains (VIAGRA|CIALIS|LEVITRA SPAM); I don’t know if you can get the same result because maybe spammed text only appears in some cases (sorry, I’m not an expert of tech stuff so I can’t give you more detailed informations on this, but if you type that URL on GOOGLE you can see they say it’s spammed… (SERP URL)). Maybe, not to disappoint your visitors, you’ll want to change that link. Being very interested in (TOPIC), I could suggest you this one, I think it could a good fit: (YOUR URL). I hope my finding can be helpful so you can fix things before too much people loose their trust in (WWW.DOMAIN.COM). In this email you can notice a dramatic approach that ensures your words will be read. Once you’ve catched the website owner’s attention, you’re affirming that you love their website and that you’d like to help, even if you’re sorry for not being able to give them technical informations (You’re a normal visitor, not an SEO, so don’t name user-agents, referer cloaking and similar stuff, but consider that spam is often cloaked, so the webmaster could land on a “normal” page clicking on the link: the SERP URL, or better a screenshot, is greatly important here). At this point, it’s likely that the webmaster will like to replace the link, and since you’ve gained their trust, they will be happy to follow your kind suggestion and link to a new good page. To enforce your message, anyway, you’re ending your email highlighting that people could change their mind about the quality of the website and stop visiting it. If you’ll do everything as I’ve suggested, I’m sure your response rate will be pretty good and most of the webmasters will thank you for your help and confirm they’ve replace the bad links. All that you’ve to do now, is to congratulate yourself for your great job (and if you’ve liked this post, share and link to it). Great and highly entertaining pat Giuseppe, well done. The only hint I’d suggest is it is probably better to spread the outreach across several phases, e.g. first you tell them they got a link to a hacked site, then you talk to them back and forth to establish better trust, then eventually you offer them a replacement for the link they removed – might look a bit suspicious offering a replacement right away, no? Thanks for your comment, IrishWonder. I’m glad you liked the idea, and I definitely agree with you: outreach could be more effective by having a longer email exchange… Excellent hint, thanks! This is a nice idea and I’m happy to see my post was a source of inspiration. As the first commenter mentioned, you may not always get a link. However, keep the tone of your email nice, informative and helpful and you are sure to establish the beginning of a positive relationship. Often times, links come down the line. Long after a relationship was first started. You’re right, Anthony, a relationship could be more valuable of a simple link. Very good point, thanks for sharing it (and for having passed by and left a comment)! Interesting method and operators, I’m going to give this a try. How often are you finding sites where links were places on entire pages that the webmasters had no idea about? Do you have any thoughts on how to approach getting a link if they’d just delete the page and link?